Stuff Points: Earn 8 points when you buy this stuff. A better way to clean your kitchen. This combo pack includes the three cloths most used in the kitchen. Take care of all those tough cleaning jobs without using chemicals. Microfiber is an advanced material that is woven into cloths consisting of over 90,000 fibers per square inch. This makes it great for cleaning, dusting, polishing, drying and more. Our microfiber cloths are superior to cotton in absorbency and cleaning power. With just water alone, these cloths will remove 99% of all dirt, grime, dust, germs and bacteria from any surface you use them on. You can use your favorite cleanser, but microfiber works so well, you don't have to. Clean Your Kitchen Fast and Easy. This combination pack includes three of our most popular microfiber cloths. The Super Scrubbing Cloth, the Waffle Weave Cloth, and the Multipurpose Cloth. Use the Super Scrubbing Cloth to wash dishes quickly. With it's scrubbing power and superior absorbency, it is far better than sponges, scouring pads or cotton rags. 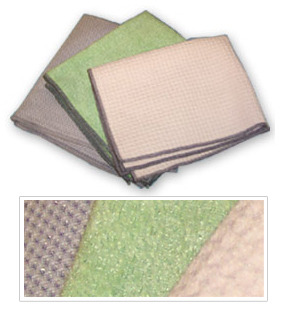 Our Waffle Weave Cloth features an advanced design for superior absorbency as well as increased scrubbing power. Use it to dry countertops, clean stovetops, inside the fridge and more. The multipurpose cloth is great for all over use. It can be used wet or dry to clean surfaces all over your kitchen. Use it damp to clean windows and mirrors to a streak-free shine. Use it dry for polishing stainless steal, dusting surfaces and more. Make cleaning your kitchen easier than ever, and do it without chemicals. Microfiber cloths are not treated with any chemicals. It is the unique weave of the fabric, and the size of the individual fibers that make these cloths clean so well. Each fiber is 1/100th the size of a human hair, and they are woven into masses that consist of tens of thousands of threads per square inch. This not only makes microfiber incredibly good at cleaning, but it also makes it highly absorbent. The fiber's wedge shaped filaments follow surfaces, lift up dirt, trap particles inside the fiber, and eliminate the need for harmful cleansers. Recieve discounted pricing when you buy more than one combo pack in a single order. Get Yours Today! Dimensions (l x w) 16" x 16" 16" x 16" 16" x 16"
Microfiber Kitchen Cloth Combo - These microfiber cleaning cloths have unmatched cleaning power. Get one cloth for every cleaning job in the kitchen. Wash dishes, dry spills, clean counters and more. Save money when you buy this convenient 3-pack. Order Yours Today! For the cloths that look like mesh click here for more info. For the cloths with a waffle texture, click here for more details. The third type will be the most smooth, and information about that one can be found here. A money saving package. Get 10 cloths for one low price. Microfiber Mesh Cloths for Tough Jobs in the Kitchen.